FRIENDLY REMINDER - MEET-UP THIS SUNDAY! 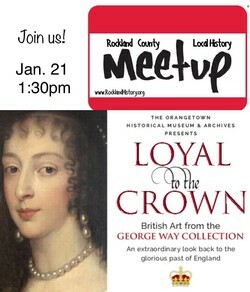 Mary Cardenas, Orangetown Historian and director of the Orangetown Museum, will guide us through "Loyal to the Crown: British Art from the George Way Collection," an extraordinary look back at the glorious past of England. George Way?s collection of British art is unique on many levels. Culled from years of stalwart searching, it represents a cumulative view of majesty. There are miniatures of Queen Mary and Charles I; chests and chairs from the Charles II period; and beautiful paintings, such as a portrait of Henrietta Maria, wife of Charles I, attributed to Sir Anthony van Dyck. The collection recalls a royal point of view from the centuries preceding the American Revolution. It is precisely this tradition of loyalty and deference to the Crown to which the exhibition seeks to call attention. In Orangetown?s Tappan, the Revolutionary War?s most infamous British spy, Major John Andre, was tried and hanged after his thwarted collusion with Major-General Benedict Arnold. For many, the power and wealth of England was indisputable; colonial loyalists viewed the Patriots' quest to break from the Crown as an untenable breach. It was a clash of sensibilities that would explode into the formation of a new nation. George Way is a steward of the past. His collection on view at the Orangetown Historical Museum & Archives personifies a past glorifying a monarchy that our nation's founders rejected. It offers a rare opportunity to be taken to a place ? loyal to the crown. This is a meet-up announcement for history enthusiasts. ?All are welcome. Parking is in the Orangetown Museum lot or on the street on Chief Bill Harris Way. For additional information, visit the HSRC's "Meetup" site at www.meetup.com/Rockland-County-Local-History-Meetup/events/246484213/.